I'm really missing having my regular weekly Willow update posts on my blog - Baby Baker Friday was so much fun to write and I love that I now have a record to look back on at all of the things we have done. It would be nice to re-start something now that she is getting older and is doing a whole lot of crazy stuff - mainly throwing and hitting at the minute - especially with her talking developing day by day too. Saying that though, anything speech related would at the moment no doubt incorporate a whole lot of her new favourite word (I'm sorry! ), "Baba" (thanks for that one Daddy!). But I suppose all she is really doing is making sure she has the all important lingo mastered first isn't she, those make-Mummy-fully-aware-of-what-I-need-before-anything-else words. Don't worry though, we are actually no where near (I don't think so anyway...how the hell do you know...?) starting potty training yet so there will be zero "baba" talk from here on in. But I will admit that when I do think of what is involved in the process I'm filled with a little bit of dread to be honest, and yes, I know I have an eleven year old so I must have done this all before but actually no I didn't, not the full on hard part anyway - I worked full-time you see so my Mum practically potty trained my son for me, so with Willow it's all new territory really and I always knew, right from her very early days that I would need all the help I could get with it. Potty training ready or not, I have always wanted, felt it important even, for Willow be as familiar and as comfortable as possible with seeing a potty, with sitting on one - even fully clothed and with a nappy on - so it would never come as a huge shock or surprise to her that suddenly, "Oh, I'm expected to sit on this thing...". From her hitting one year we've almost always had a potty out in our living room, mainly acting as a rather unique looking ornament but we wanted her to see it, to hear us speak about it and for her to be encouraged to touch it and sit on it - I don't think for a second she ever knew what we were waffling on about in the early days, but at least we attempted to get the "potties are OK" message planted firmly from an early age. ...she loves sitting on potties and even makes a bee-line for the one they have out at a lovely playgroup we attend. Yep - she adores it. And whilst I'm not yet encouraging clambering up onto the toilet to test out the training seat I just know that it is going to be brilliant at giving Willow a little more reassurance when we move on to the toilet using stage - she's only teeny you see and anything that helps stop her little self getting wedged into the loo is already a winner in my eyes. 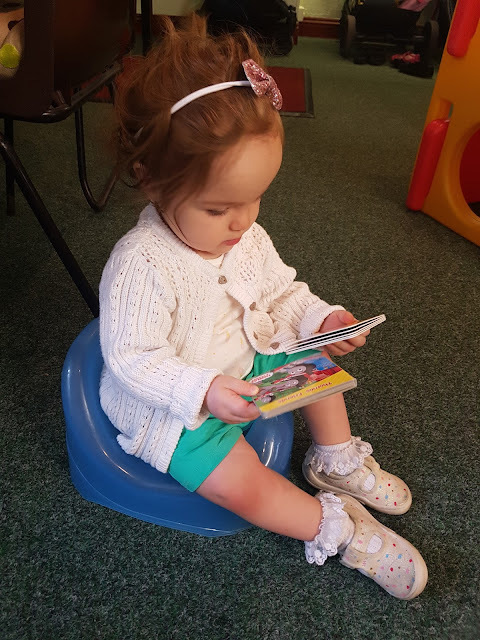 The perfect place to sit and read her new favourite Peppa Pig book.